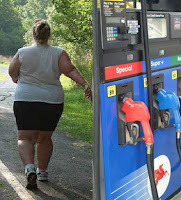 ATHENS, OH - Researchers at Russ College of Engineering and Technology at Ohio University have calculated that if every adult in the United States lost fifteen pounds, the savings to the economy in gasoline alone would amount to three billion dollars over the next year. Cascading savings from the weight loss would also include fuel savings on fewer shipments of food, reduction in health care costs, as well as a reduction in gasoline demand which in turn would cause an overall drop in gas prices of approximately eight cents per gallon. Other areas of the economy would see a positive spin from the weigh loss. “You would also see a spike in the retail industry as smaller Americas seek out new clothes,” smiled Dr. Good. "Indeed, our research shows that the only business segment detrimented [sic] by a slimmer, trimmer America would be the health club / fitness industry. But really, with revolutionary home fitness solutions like Billy Blanks' Tae-Bo, Bowflex and the Hawaii Chair, traveling to gymnasiums is an idea whose time has come and gone, which ultimately contributes to further decreases in fuel consumption. It's a snowball effect." "Nice post.submit all your posts at www.surfurls.com .Its a social bookmarking site ". lbs = how many gallons of gas? hey, stephen hawking!!! how much energy does it take in dollar amounts for some 240lb person to walk FAST to equal the amount of money it costs for a gallon of gas today? Is the next step Soylent Green?